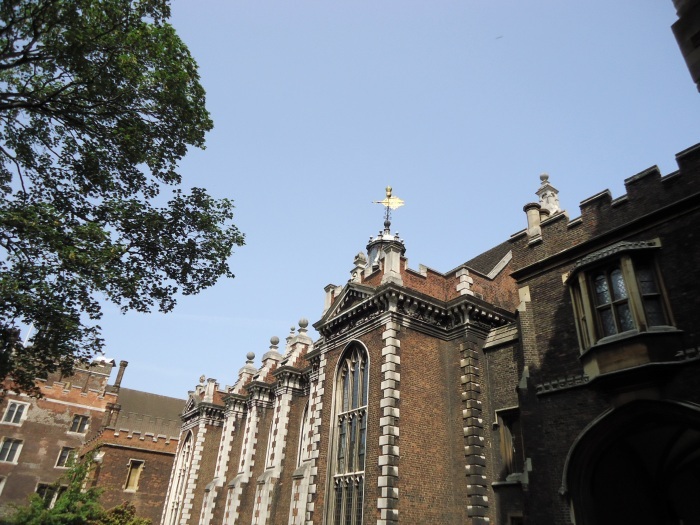 Last week as a thank you to our project volunteers, many of whom have now been with us for six months, we went on a trip to Lambeth Palace Library and Archive. The staff at Lambeth Palace Library very kindly gave us a tour of the Palace and told us about the work they do. 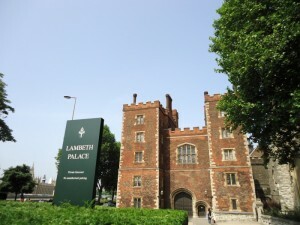 We heard about the history of Lambeth Palace and the history of its Library, both of which are very interesting. The tour took us behind the scenes to the Library’s conservation studio and store rooms. We also had a look at the exhibitions in the Great Hall, including some volumes that have recently been conserved; the most unusual being a book about the types of beer found in Yorkshire! 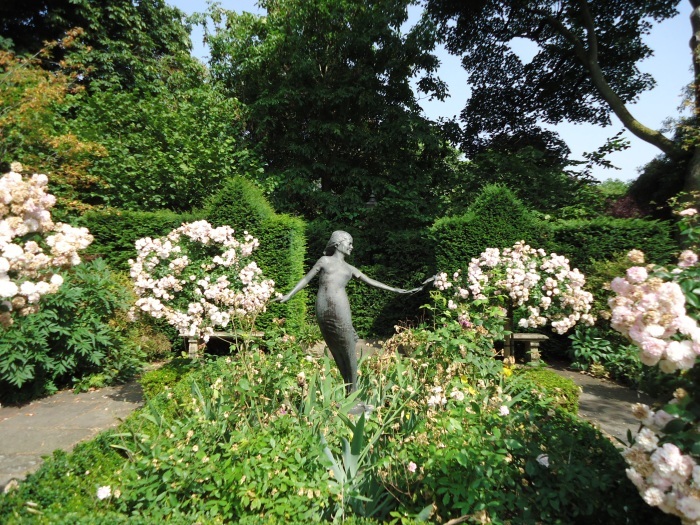 Finally, we were given a tour of the gardens at Lambeth Palace, which were lovely, especially given the sunshine we’ve been having in London recently. Many thanks to Lambeth Palace Library for a great afternoon, and many thanks to our volunteers for their help with this project! For more information about Lambeth Palace Library, please see their website. For some children’s homes we are lucky to have a surviving medical book. These books allow you to follow the progress of the health of the children in the home over a set period of time, which makes them a great way of researching instances of diseases and medical conditions and finding out how they were treated. 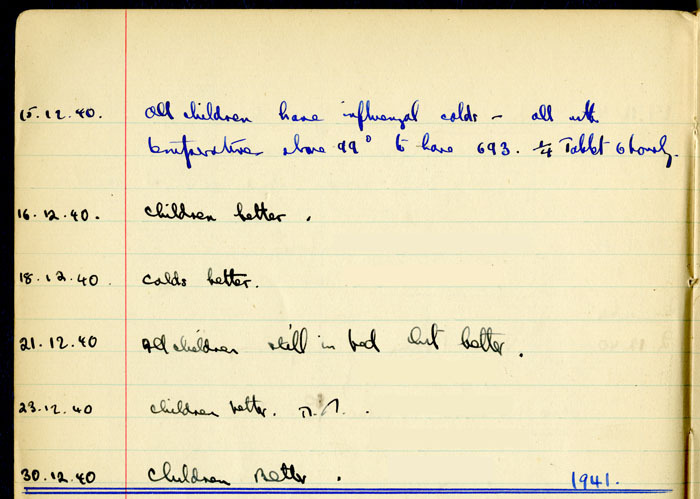 It appears that the medical books were kept by the medical officers for each of the children’s homes, with the medical officer making a note in the book each time they were called in examine a child. The following image is an entry from the medical book for Sunnyside Nursery in Box, Wiltshire, from December 1940.
temperature above 99º to have 693. 1/4 Tablet 6 hourly. 21.12.40 All children still in bed but better. While some medical conditions were specific to some children, the way the book is set out makes it easy to note outbreaks of diseases throughout the nursery too. 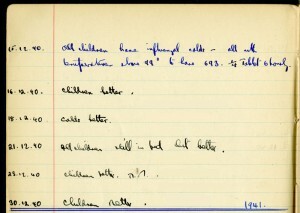 Here we can see that in mid-December 1940, all the children in Sunnyside Nursery came down with flu-like colds. The children here were treated with 693 (also called sulphapyridine), which was a widely-used medicine at the time. From this distance, it is not possible to tell if the medicine was effective, but what the record does show is that the children all got better over the next two weeks. Hopefully they were well enough to enjoy their Christmas celebrations. Certainly no mention of the colds are made after the end of December. This is just one page from the book. If we studied the rest of the book, it could well bring up some interesting information: Were there any other instances of influenza or flu-like colds? Were there any other outbreaks of diseases that affected all the children in the nursery? And was 693 used to treat any other medical conditions? Putting this information together could help to build up a detailed picture of medical care in the 1940s.